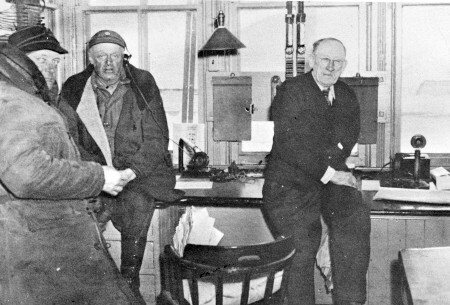 Railroad employees in about 1930 included, from left: Harry Schroeder, Hans Clausen and depot agent Ed Brady. They are shown inside the depot. Ed Brady served the longest time of any Aspinwall depot agents, from 1908 until 1948. Others we have record of include F.H. Merrill, who was serving in 1884 at the time that W.J. Larue was manning the pump engine for the railroad company; S.B. Nichols, agent in 1888; Art Case, 1909 to 1913; Gene Burns, who was after Brady; and Gordon Younie, who was serving as agent when the job was discontinued in 1957. The depot was torn down in 1959. Aspinwall also had a section house for the railroad section foreman and his family, such as Chris Kaiser in the 1880s, Mr. Grove in about 1905, Charles Patton, Henry Hulsebus and William J. Schroeder. Schroeder started working for the Milwaukee in 1917 and was 26 years old when named foreman in 1924; he was one of the youngest to ever serve this job, and he continued working for the Milwaukee until 1957. The section house was 18 by 28 feet and included a kitchen, living room and bedroom downstairs, and several bedrooms upstairs. It was located at the western part of town, and the property also had a chicken house, shed, root cellar, well and a privy, according to the railroad maps. Louie Ehrichs bought the section house in about 1926, tore it down, and made garages from the lumber. The section house had continued to be the home of section men until its final days. The original section gangs included eight workers, but as hand labor was replaced by mechanization, the gang was decreased to a foreman and one- to four-member crews. A number of young Aspinwall men received their first paychecks as railroad workers, either on the line, cleaning snow off the tracks in winter, or working in the railroad-owned stockyards. Harry Jansen was one; he worked on the bridge crew for four years, starting in 1935, and his job as a pile driver took him to different construction spots along the line. Crew members stayed in bunk cars, Harry said. LaVerne Schroeder, age 18 when new rail was laid in 1940, remembers working on a crew of 15 to 25 laborers. Each three feet of the new rail weighed 112 pounds, making the old rail installed in 1913 feel like "model railroad tracks." LaVerne has continued working with the Milwaukee, and today is located in their Chicago general service headquarters. Although the list is probably incomplete, following are some of the many Aspinwall men who have worked on the railroad throughout the years: Harry Schroeder, Hans Clausen, Harry Boyens, Bob Wailes, Chris Mohr, Lester Soll, Roy Soll, August Ehrichs, Bill Soll, Andrew Babik, John Babik, Art Brandenburg, Walter Schwiesow, Alvin Schilling, Walter Barten, Lester Dammann, William Jensen, Donald Schroeder, Julius Molter, Glenn Ehrichs, Lester Boyens, Harry Kruetzfeldt and Ray Ohde. 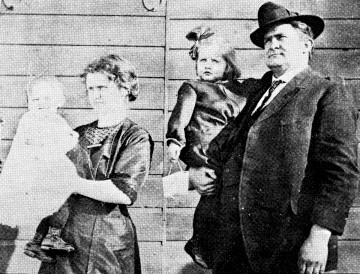 Art Case and his wife Edith with their children, Vera and Vergie. Mr. Case served as depot agent in Aspinwall from 1909 to 1913. Mishaps occasionally occurred along the railroad line, and the Aspinwall area was no exception. One of the first accounts reported in the Manning Monitor took place in June, 1895. "Accidents on the Milwaukee Road have been exceedingly rare during late years, but a most horrible one happened between Manilla and Aspinwall Wednesday morning. "John Peterson, an employee of the CM&SP Railway, was struck by the westbound freight No. 65 about four miles west of Aspinwall at 8 Wednesday morning and instantly killed. Peterson was a section hand, and resided at Aspinwall. At the time of the accident, he was on a hand car going to Manilla with a number of other section men. They failed to keep a proper lookout for No. 65, which was two hours late that morning, and which came upon them so suddenly that they barely had time to get their car off the track. Peterson was a new man, and becoming confused, it is thought by the hurry and excitement, accidentally slipped and fell across the track, the train striking him before his companions could go to his assistance. "The unfortunate man was terribly mangled about the head and shoulders, and death must have occurred instantly. "The freight is said to have been running at about the regular rate of speed, and no blame is laid upon the engineer of that train. The accident was wholly due to circumstances over which no one other than the deceased could have had control. "The remains were taken to the home at Aspinwall, and the funeral was held Wednesday afternoon. The deceased was a man about 35 years of age and leaves a wife and three children. He was a respected citizen of the little town in which he lived, and his sudden death was a sad shock to the entire community. The sympathy of all goes out to the bereaved wife and her fatherless children." The upstairs depot windows went all the way down to the floor, and the kids could sit in them with their legs hanging out. Once a son of a depot agent, who was very little at the time, saw a little friend coming down the road to play with him; the tyke got so excited that he walked right out the window and fell to the ground below. He landed on his feet, and consequently his leg bones were all pushed up into his hip. He never recovered from that. Don Brady fell out of one of the windows, too, but Don was made of better stuff and wasn't hurt so bad. Elmer Mueller, whose uncles ran the Wiese Bros. Grocery Store and Creamery. Three cars of a train derailed near Aspinwall early in 1902; the switch rod broke and part of the train went on the switch and the rest on the main line. One was loaded with pianos. ANOTHER DEATH ON THE RAIL . . .
Mr. John Segebart was run down by fast freight No. 70 at the Milwaukee crossing just east of Aspinwall about 5:30 Monday evening. Mr. Segebart is the tenant on the M.J. Collins' farm in Iowa Township. He was returning home from Aspinwall and had about 2300 pounds of coal on his wagon; and it is stated that he was lying on top of the load of coal on his fur coat; apparently asleep while the team was coming along on their way home of their own accord. The train crew saw the team approaching the crossing, and the engineer blew the whistle, as usual, thinking, of course, that the team would approach close to the crossing and then stop; but instead they came right upon the crossing in front of the rapidly approaching train. The train was in charge of conductor Tucker and was pulled by a double header. The engine struck Segebart's wagon, completely demolishing it, and carrying the unfortunate man fully two car lengths before the train could be stopped. The train crew immediately went to the rescue, finding him quite dead; his head was mashed and one arm broken, though no other marks were found on his body. The body was removed to the Aspinwall depot and the coroner summoned. A jury was impaneled and a verdict rendered, the nature of which we were unable to learn. The body was then taken to I.B. Alfred's undertaking rooms at this point where he was prepared for burial. Mr. Segebart was a son of Mr. and Mrs. John Segebart who reside at Manilla. The deceased leaves a wife and four children, and his sad untimely death is deplored by the entire community. The funeral services were held today, interment being made in the Nishnabotna Cemetery. "John Segebart was my grandfather. One of four children mentioned was my mother, Elizabeth Segebart Comstock, now deceased, and she was 3 1/2 years old when this happened. 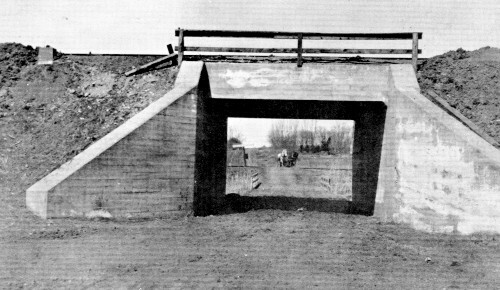 The accident occurred on the old Milwaukee tracks, the embankment of which is still visible just north of the present tracks. Elizabeth's older brother, Louie Segebart of Denison, died a few years ago, another older brother, John Segebart now lives near Ida Grove, and their younger brother, Charles Segebart, now lives in Fresno, California." In the picture above, Louie Ehrichs is shown with his team of horses raised from colts. On the day when the last trains traveled on the original railroad tracks, in October of 1914, a freak accident took the life of the horses and the buggy was demolished. As Louie was leaving Aspinwall to work with his brother Chris, a fast passenger train running late gave no warning and excited the horses, who bolted towards the old railroad tracks and were thus killed. Louie jumped to safety. 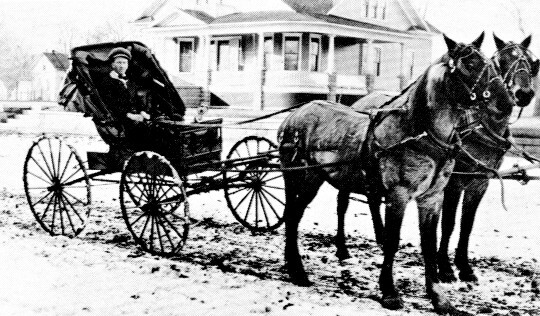 The second photo shows Peter Roggendorf driving his team of horses from his farm into Aspinwall. This photo was taken for insurance purposes after the Ehrichs accident. Harry E. Robison, whose home is about one mile west of Aspinwall, was instantly killed April 13, 1908 as a passenger train hit him. Robison presumably was on his way home from a dance Sunday evening at the Aspinwall dance hall; he left the hall about 4 a.m. and was not seen alive again. At the coroner's request, the fireman and engineer of C.M. and St. Paul train #1 both testified that when they first saw Robison he was lying outside the track with one foot over the rail and with his head turned toward the engine. They blew the whistle several times but the victim made no motion whatever. The verdict was that the victim came to his death by an act of his own carelessness. Mr. Robison has resided in this vicinity nearly all of his life and his untimely death comes as a terrible shock to his many friends. He was a sober, industrious and hard working young man, following the vocation of a farmer. He is survived by a sister, Mrs. Ferdinand Mundt.